PRESIDENT Hage Geingob yesterday said Namibia will donate fish to Cyclone Idai victims in Mozambique, Malawi and Zimbabwe. Cyclone Idai has killed about 200 people in the three countries, and also left a trail of infrastructural destruction. Hundreds of other people are reported missing. 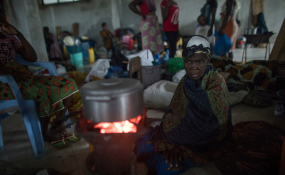 According to several news reports, about 84 people died in Mozambique; 56 in Malawi and 82 in Zimbabwe since the cyclone landed on 13 March, and fizzled out on 16 March. There are fears, however, that the death toll could jump to as high as 1 000 in the three countries. Geingob, who sent condolences to the governments of the three countries, said Namibia will donate fish. He also appealed to Namibians - the public and the business community - to help their "brothers and sisters". As the Southern African Development Community chairperson, Geingob urged other countries in the region to stand in solidarity with the people of the three countries to find a collective way to assist them. International relations minister Netumbo Nandi-Ndaitwah told The Namibian yesterday that the situation in the affected countries was quite dire. She said Namibia was in contact with Botswana, where SADC's secretariat is based, on what collective solutions to take to assist. On Monday, the Namibian Meteorological Services said Cyclone Idai would not reach Botswana. The chief forecaster, Odillo Kgobetsi, told The Namibian that according to their forecast, the cyclone will weaken and decrease in intensity within days.